Let the games begin…it is now snowing in State College and Altoona in upstate Pennsylvania and the look to winter is suddenly upon us in the Mid-Atlantic region. Low pressure today will head towards the Mid-Atlantic coastline and a cold rain in the I-95 corridor may actually end as a mix of sleet or snow tonight to the north and west of the big cities. A powerful cold front will arrive with gusty winds on Thursday night and usher in an Arctic blast for Friday and Saturday with the lowest temperatures of the season so far and possible record-breaking low temperatures in many spots. 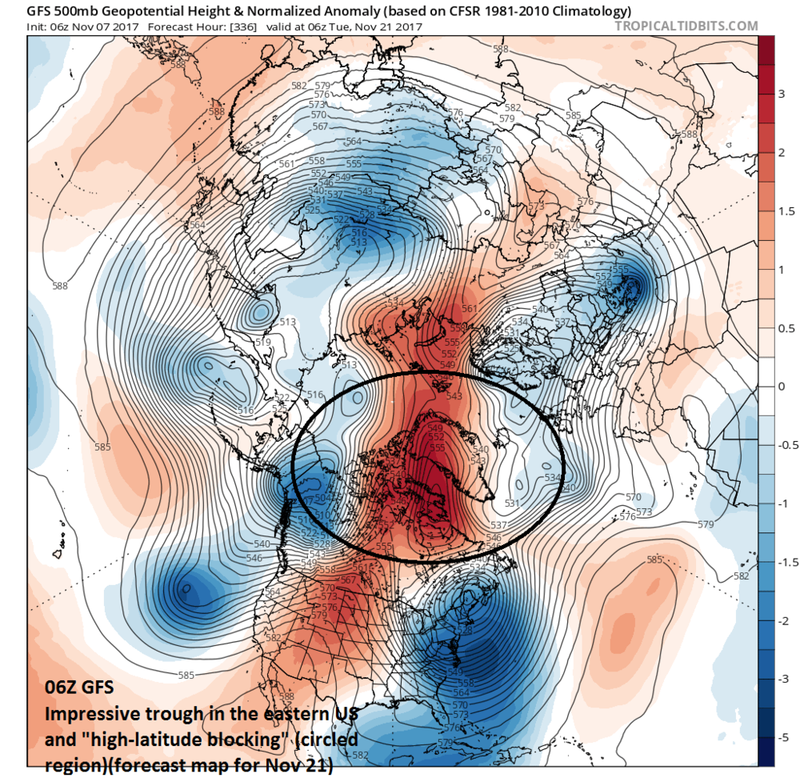 An overall upper-atmosphere pattern with “high-latitude blocking” is looking increasingly likely for later this month and that could result in more cold air outbreaks for the Mid-Atlantic region by the time Thanksgiving week rolls around. Low pressure has formed along a stalled out frontal boundary zone over the Tennessee Valley and it is heading towards the Mid-Atlantic coastline. Cold air pushed in overnight from the northwest and it has already become cold enough in upstate Pennsylvania for snow to fall (e.g., State College, Altoona). The rain/snow line should slowly press to the southeast as the day progresses. As the low pressure slides off the coast later today and tonight, it could actually become cold enough just to the north and west of the big cities for some sleet or snow to mix in; especially, in higher elevation locations. Another strong cold front will arrive in the I-95 corridor on Thursday night with gusty winds and this will usher in the coldest air mass of the season so far and temperatures will be well below normal on Friday and Saturday. Before this Arctic front arrives in the local region, it is likely to produce snow squalls over the Great Lakes as there will be quite an unstable lower atmosphere temperature contrast between the charging Arctic air mass and the still relatively warm waters. By early Saturday morning, temperatures in the 20’s are all but certain in the immediate I-95 corridor – perhaps even down to the 20 degree mark in some spots – and wind chills will become quite a noticeable factor during the onset of the Arctic air. This intense Arctic cold air blast will ease up on Sunday and Monday, but temperatures in DC, Philly and NYC should remain below-normal for this time of year. There are reasons to believe that the prospects for “high-latitude blocking” events this winter are pretty good as discussed extensively in the “2017-2018 Winter Outlook” with regard to three important factors: low solar activity, an increase in the autumnal snowpack across Siberia, and the Arctic Oscillation (AO) index. “High-latitude blocking” in the wintertime involves higher-than-normal pressure in places like Greenland, Iceland and northeastern Canada and it is important to monitor around here as it often results in sustained cold air outbreaks for the central and eastern US. The latest runs of the GFS and European computer forecast models feature abnormally high pressure in these particular areas later this month and the predicted tanking of the AO index supports this idea for "high-latitude blocking" (i.e., negative AO). Bottom line…this late week Arctic blast may not be the last of the month...it could be quite cold for Thanksgiving Day.